Welcome to Galaxy, the best place to host your Meteor app! When migrating your app you’ll want to deploy a new instance of your app to Galaxy, ensure it works, and then switch over DNS from your prior hosting provider to Galaxy. This way you’ll minimize any disruption to your users during your app migration. You’ll need a Galaxy account that your Meteor Development Account has deploy authorization to use. Sign up here for a new Galaxy Account. If your Meteor application has a package that requires Mongo, then you’ll need a Mongo database configured for your application. If you want to use a hosted database provider, we recommend using a dedicated database hosting service such as MongoDB Atlas. For optimum performance, we recommend that you setup a database in the same AWS region as your app deployment. Create a Meteor settings file that will define the set of configurations needed for your application to deploy and run on Galaxy. In your application directory, create a file named settings.json. For a full explanation and a more detailed example of the settings.json file, see Environment Variables. For this initial deployment of your app, use a hostname from one of the Galaxy-included .meteorapp.com subdomains. For apps deployed to Galaxy’s US East region, deploy to <your_app_name>.meteorapp.com. For apps deployed to Galaxy’s EU West region, deploy to <your_app_name>.eu.meteorapp.com. For apps deployed to Galaxy’s Asia-Pacific region, deploy to <your_app_name>.au.meteorapp.com. You’ll later configure DNS to point your existing domain to your app on Galaxy. region is ‘galaxy.meteor.com’ for US East, ‘eu-west-1.galaxy.meteor.com’ for EU West, and ‘ap-southeast-2.galaxy.meteor.com’ for Asia-Pacific. hostname is the fully qualified domain name where you’re planning to host your application (using <your_app_name> in the .meteorapp.com hostname format, in this example). filepath.json is the path to your settings file (for example, ‘./settings.json’). If you are using Windows, the commands to deploy are slightly different. You need to set the environment variable specifying your region first, then run the deployment command second (the syntax is the same as everything you’d put for meteor deploy). Verify that the deployment was successful. Check to see if the application is accessible by navigating to your configured URL, which should be using the .meteorapp.com format. Then check the application logs in Galaxy to see if there are any errors that are affecting the deployment. Once your application is successfully deployed, head on over to the Galaxy dashboard in your region (example: US East) to finish configuring your application. 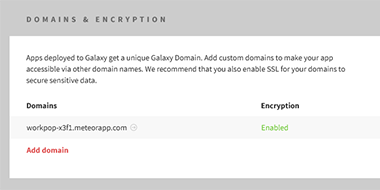 Add your custom domain in the Galaxy application’s settings page. You will now update your DNS settings to cut over from pointing to your prior hosting provider to Galaxy. galaxy-ingress.meteor.com for applications in the US East region. If you are deploying to a root domain (for example mydomain.com), then follow the advanced instructions here. Enable encryption as a best practice by generating a free Let’s Encrypt certificate or uploading your own custom certificate. If you aren’t able to complete your app migration, contact Galaxy Support and we’ll assist you.